All the way back in October we brought you the news of the release of the refreshed line up of Lavasoft’s flagship security software: Ad-Aware Anti-Malware and Anti-Virus and now two months later we’re back to have a look at how it’s fared and whether or not the new versions deserve the reputation that the brand has gained over the last few years. So why two months? Yes it is quite a while but one of the (if not the) most important aspects of anti-virus (AV) software is its ability to adapt to new malware threats and over this time we’ve seen a whole host of new problems arise – so can even the Free version of Ad-Aware cope? Personally I found this the hardest thing to review yet, and the reason for this is that quality of AV is judged by not only how much it ‘does’ (i.e. threats found, stopped and removed) but how much this does it in the background. Not having anything pop up from the software for weeks on end can either mean that it’s doing its job brilliantly or it hasn’t recognised anything and your computer has become a Virus feeding ground. So before we get onto how effective the anti-malware software is let’s look at some of the ergonomics which although is superficial if the software doesn’t work is still very important for a good all round product. For starters it’s very easy to install (which is very nice, although to be expected) and is set up in a matter of minutes, and once it’s up and running you’re presented with a nice clear layout with four main ‘tabs’ (Main, Scan, Ad-Watch and Extras) each of which has a collection of relevant settings… and if this is all too much for you there’s a little simple/advanced switch which just leaves you with the basics using default settings allowing for one click scans, updating and Ad-Watch status (i.e. on or off! ), shown left. Whilst this may seem a little over simplistic and patronising it is in fact kind of useful — once you’ve set it you to your preferences (including custom ‘profile’ scans which you can save, and which only search certain areas of your PC for problems) you can just put it into simple mode and not be bothered by all the different settings and permutations of malware scan methods. So the front-end is very nice and easy to use (and as of yet it has only popped up once asking me if I would like to upgrade, which is less than my AVG alternative) but is it actually any good at what it does? Well as of yet I haven’t had any qualms with it (as the free version does not incorporate anti-virus I have been combining it with AVG’s anti-virus software) and the odd occasion where a rootkit has slipped through the net it’s been quick to pick it up and makes it very easy to deal with. Unfortunately having only the free version means some of the more advanced features such as the network drive scanning and ‘do not disturb’ mode (which would be especially useful for gamers) are not available, and there’s also no kind of scheduler so you can only do scans when you remember to which is a shame, but of course if you are happy to pay for protection then it is available for a small fee (around £20 and £30 for the plus and pro editions respectively). 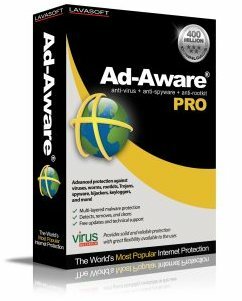 So, that’s an overview of the new Ad-Aware Anti-Malware software and I have to say I am quite impressed — they have managed to get the combination of the need for features and simplicity at the same time down to a fine art, and when coupled with more than capable software behind the front end you have a very functional and easy to use (and of course free) protection for your PC! Do Mac OS X Users Need Anti-Virus Protection?